Flawless and Rip Trippers unite together to bring you The Merge! MaMa's cookies'n'creme crumbles, vanilla ice cream and pistachio. 70% VG ..
Flawless and Rip Trippers unite together to bring you The Merge! Refreshing blend of strawberry, watermelon and lemonade to create a perfect balance of sweet and tangy for the perfect all day vape. A firm favourite here no doubt! 70% VG .. The Cupcake Man is a vanilla cupcake drizzled in sweet strawberry frosting, topped with sprinkles. 70% VG ..
A vanilla cupcake drizzled in sweet Blueberry frosting, topped with sprinkles. 70% VG ..
Flawless - Fruit Burst - These classic chewy Strawberry flavoured sweet bursts your taste buds unleashing the juiciness with every inhale! Product Feature: Bottle Size: 60ml 6x10ml PG/VG: 30% PG/70% VG Nicotine Strength: 3mg Key Flavours: Strawberry ..
Vape Pop - Strawnana Melon will remind everyone of their younger years. Strawnana Melon is a decedent Strawberries blended with ripened banana inhale with a sweet and subtle melon candy exhale. Product Feature: Bottle Size: 60ml 6x10ml PG/VG: 30% PG/70% VG Nicotine Strength: 3mg Key ..
Flawless - Conquer your cravings of sweetness with this deliciously sticky blueberry cookie dough e-liquid, if you love blueberry then be sure to swipe yourself a bottle of Vape Dough from the start its a sweet blueberry then you don’t know whether to chew or to exhale as the sticky cookie dough bec..
Flawless E-liquid - Gamover is a delicious mix of fruity artificial cereal circles with a burst of vanilla bean ice cream made by one of the most notorious manufacturers, Gameover features a 78/22 VG to PG ratio producing amazing flavors. 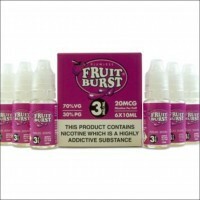 Product Feature: Bottle Size: 30ml 3x10ml PG/VG: 22..
Raspberry with doughnut. VG/PG: 50/50 Nicotine Level: 20MG Salt Nicotine eLiquid Refills use the natural salt found within the tobacco leaf as their base for nicotine. 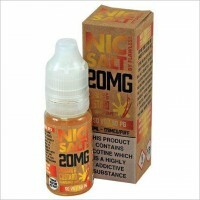 Nicotine Salt eLiquids aim to provide a more potent nicotine hit than most eLiquids can currently provide Salt .. Strawberry flavour. VG/PG: 50/50 Nicotine Level: 20MG Salt Nicotine eLiquid Refills use the natural salt found within the tobacco leaf as their base for nicotine. 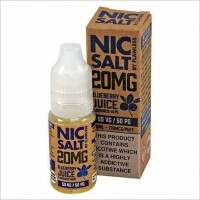 Nicotine Salt eLiquids aim to provide a more potent nicotine hit than most eLiquids can currently provide Salt Nic E..
Blueberry flavour. VG/PG: 50/50 Nicotine Level: 20MG Salt Nicotine eLiquid Refills use the natural salt found within the tobacco leaf as their base for nicotine. Nicotine Salt eLiquids aim to provide a more potent nicotine hit than most eLiquids can currently provide Salt Nic E-..
Mango with citrus. VG/PG: 50/50 Nicotine Level: 20MG Salt Nicotine eLiquid Refills use the natural salt found within the tobacco leaf as their base for nicotine. Nicotine Salt eLiquids aim to provide a more potent nicotine hit than most eLiquids can currently provide Salt Nic E-..
Fruit candy. VG/PG: 50/50 Nicotine Level: 20MG Salt Nicotine eLiquid Refills use the natural salt found within the tobacco leaf as their base for nicotine. 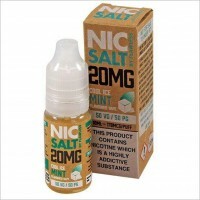 Nicotine Salt eLiquids aim to provide a more potent nicotine hit than most eLiquids can currently provide Salt Nic E-Juices..
Rhubarb and Custard. VG/PG: 50/50 Nicotine Level: 20MG Salt Nicotine eLiquid Refills use the natural salt found within the tobacco leaf as their base for nicotine. 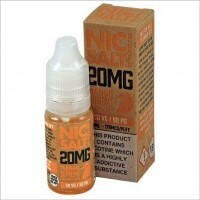 Nicotine Salt eLiquids aim to provide a more potent nicotine hit than most eLiquids can currently provide Salt Nic .. Cool ice mint. VG/PG: 50/50 Nicotine Level: 20MG Salt Nicotine eLiquid Refills use the natural salt found within the tobacco leaf as their base for nicotine. Nicotine Salt eLiquids aim to provide a more potent nicotine hit than most eLiquids can currently provide Salt Nic E-Juic..